By default, to control status of your tasks, you need to open the program′s main window and find them in the Task View pane. For more convenience, you can receive notifications about task results via e-mail. This behavior is task-specific and needs to be enabled for each task individually. For more details, please see New Task: Pre-, Post-Operation Actions. E-mail notifications are sent by the Server component of the software. In settings, you need to specify parameters of your mail server, sender, message template, etc. SMTP server. Mail server to use to send e-mails. Connection type. Select a connection type used for your email service. SSL protocol. Set up a specific SSL protocol used by your mail server. Note: If you do not know the exact parameters of your SSL protocol, set up this option to “OS default”. Modify this value only when you are know the need to change this parameter! Body. Click Edit Message Body to change welcome message, signature etc. 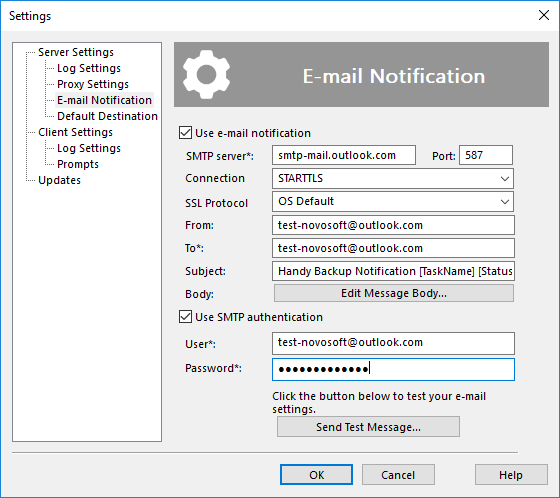 Check Use SMTP notification if your SMTP server requires authorization. Enter the required information in the User and Password fields. Click Send Test Message to test that all fields are set correctly.